Here I am getting nitpicky again. Pardon me, too general of a statement. Hand forging, folding etc. evens carbon distribution, mainly. Steel produced from quality sources in the present era isn't in need of carbon redistribution. What evens carbon is time at temperature. Hand forging and folding can contribute to carbon diffusion due to time spent at temperature, but the mere act of forging doesn't necessarily even carbon distribution. For instance, there are some earlier methods of construction where there is a very thin high carbon strip on the edge of the sword only , and the idea behind that is that you want a concentration of carbon at the point of impact and save precious steel This is the *opposite* of even distribution, but was achieved by forging. Also, one main reason for folding with early iron wasn't to even carbon, it was to further refine the material by "squeezing" the slag out the ends with each fold. The reason it was important to forge close to shape was to align the slag stringers so that they didn't weaken the blade. Thanks guys, basically I just curious about Rob's remark that by peening the end of the tang, it would make the overall blade more brittle. and peened tang on a modern tool steel blade will be brittle due to the heat used in the peening without the ability to anneal it afterwards. That really isn't the case. With a simple steel like is used for the majority of swords, it's not an issue. If you hot peen, you're annealing it anyway. Even if you are using an alloy that will air harden, you probably have the ability to let it cool slowly to anneal it, it aint that hard, on the whole. Don't worry, I'm not trying to modify any anyiques. I just have a couple MRL swords, a India made rapier that is a knock off of an MRL, and one of Highland Steele's monsters I'm putting new hilts on, and making some modifcations to. I use a two piece grip construction on my swords, as I find that I can get a much tighter hilt assembly this way , with no risk of splitting the grip. After the pommel is piened in place and secured, I secure the quillon and then make and fit the grip. The result ,IMO is a much more secure assembly, which as most of my weapons are intended primarilly for re enactment use is a necessity. As far as wedging the guard and pommel into place, I suppose it would require a bit more precision in your measurements, openings, etc. From the point of view of making the grip core, I think it is a lot easier. I have made a few new grips for my swords. In the past I used the bore through method because the grip was going on a sword with a threaded tang, or I had an existing grip that needed the bored hole enlarged. It can be a pain to get a file or chisel into the grip and remove the material you want. I also recently made a new grip for a sword that originally had a plastic grip core. I cut my block of wood in half and carved out the inside of the grip as though the sword used the sandwich method. Because this sword also has a threaded tang, I went ahead and glued the two pices to together and they slide on just like a bored grip. By shaping it in two pieces, however, I was able to shape the core in a couple of hours, and with almost no headaches. Wrapping it then took about three weeks, but that is a different post. I would personally recomend always (unless there is an extenuating circumstance that requires you to do otherwise) making grips as though they were going to be sandwitched onto a sword, even if you end up gluing th two pieces together and sliding it over the tang in the end. I would also recomed that you remember the old adage, "measure twice, cut once." I do recognise that the historically correct way to assemble the sword is generally a sandwich construction,but i do maintain that a tool steel heated and peened is a stressed component,it is NOT annealled by being heated and hammered,and remains in a brittle state at the head of the tang,even if that does not peneterate particularily deeply through the pommel. the construction i use does not have an Historical precedent,as stated,it is to facilitate a breakdown of the components,whether that is to your taste or not,a lot of people like to take a sword apart and examine the tang stamp and construction,this is my choice,it also allows for a change of guard,grip and pommel. There are so many threads on the supposed advantage of forging over stock removal,my understanding was that it is a superior method,but i also read a lot that questioned that from good sources.The main point seems to be that if you forge a blade it will change the structure,but that work would be undone through the annealling and stress relieving,and in essence there would be no difference in the blade compared to a simple stock removal. I had a metallurgist visit me recently,he is responsible for safety and construction in North Sea oil rigs,working for the Lloyds Register,an interesting guy.I put the question to him 'does a forged blade lose its integrity through annealing and heat treatment?and is a forged blade superior to a stock item?. He maintains that in order to undo the work of the hammer on the blade structure one would have to heat to almost white hot,and that there is a very good reason why industry insists on forged components over ground,for the integrity and added structural ability of the steel. Me? what do I know? a pic of the construction that i use. Hey Rob, those are some fine lookin' swords there. Thanks for the input, I was hoping you'd chime in with your own observations. In terms of industries insisting on forged parts: many of them are moving towards cast parts manufactured by processes such as investment casting and Metal Injection Molding (MIM). These processes are replacing more and more "forged" parts all the time. There's also forging, and then there's forging. How much experience does your friend have in antique arms design? A forged part for an oil rig is quite a different thing than a sword blade. I'm not saying this in a confrontational way, what I'm trying to do is to put it in perspective. I may be familiar with sword design and construction, but that doesn't mean I can make one. The same applies to your friends interpretation of forging in the context of edged weapons. If anything experience has shown us that either forging or stock removal can result in a durable and functional blade. This aspect of sword construction is really a non-issue at the beginning of the 21st century. What does matter is the knowledge and skill of the craftsman, not the process he or she chooses to employ. It looks like you have plenty of experience and skill with forging, that should be enough. I personally prefer forged weapons because that is the traditional process and I value it for that reason, but that doesn't mean I believe they're structurally superior. That sword you've posted has always been one of my favorites from your line-up. Very nice looking, and even though the construction method isn't my first choice it wouldn't stop me from buying one. That was the pic I originally tried to include in my post! Thanks Rob, it's nice to hear what you have to say considering your actually making the swords. when i started out some fifteen years ago my learning was led almost exclusively by Jim Hrisoulas books,which i still refer to and respect to this day,my opinions on forging were influenced by his work. i know that some people have come down on those opinions over on the 'other' Forum,but i havent yet seen any demonstrative tests for comparison. I would like to know as much as the next person what the 'truth' is,it would be tempting to put up a piece for destruction testing to find out...at the risk of failure...ulp,if anyone else would put their work into a test it would be interesting,but i suppose the problem is getting a uniform style and steel type to work from,a lot of the 'knowledge' around is hypothetical and allegorical,so we all need answers some time. Wow, Rob, that's a beautiful sword. I cant be certain what the grip covering is, is that wire? the pic is juuust grainy enough that I'm not sure. Just beautiful, man, kudos to you. Yes, it's wire with silver ferrules. Rob offers a lot of options on that particular sword. Here's an old review of this model. As I said, this is one of my favorites in the Castle Keep line-up. I've often been tempted to order one but other things always seem to get in the way. It's my sword in the review that Patrick referenced. Interesting bit about that sword (or maybe not I suppose) but things tend to come and go in my collection. It's the Arms and Armor swords that I hang on to... with the exception of this sword from Rob and a couple of the Albion museum line pieces. I've kept it and I'll keep it. It's a great piece and it's good enough to be hard to believe that it's hand forged. Not doubting Rob for a moment when he says it is... my point is that it's that good on the craftsmanship. It's a great piece and it's good enough to be hard to believe that it's hand forged. Russ, please elaborate on this point. A swords finish has to do with the finishing process. The method of manufacture has nothing to do with it, and people shouldn't assume that a forged blade will be rougher than a ground one. A good point Patrick. Far too often I've seen "well it's hand forged" used as an excuse for a poor finish on a piece. This can be used to excuse all sorts of things from tolerances are to open at the fitting of the hilt to assymetrical blades, to wavy fullers to off center tips. After seeing Mr. Miller's work ( or Mr. Evans or Mr. Cashen's as far as that goes) I can say that hand forged does not have to equal rough. Rob's stuff could easily be mistaken for CNC done work. On the piece I have everything is symmetrical, everything fits together tightly with no gaps at the blade/cross juncture and there are no ripples or waves in either the blade flat or edge. As mentioned in my review the only thing that ever so slightly gives Rob away is the terminals of his fullers... they aren't quite machine perfect... give him some time though. I'm singling Rob out in this post because its sort of on topic for this thread. However there are other talented individuals out there that exhibit the same attention to detail that turn out well finished hand forged pieces. They don't try to excuse themselves from doing the finishing by saying "it's hand forged." They finish the pieces properly. Hot riveting/peening of the tang against the pommel does not have to produce brittleness. It depends on at what temperature it was done and if it is propery annealed afterwards. This is of critical importance. If done at near white heat and left as is, it will surely be brittle. One should not do that! If done at lower forging temp the effect is very diferent. You will produce a rivet head that is larger than is possible if shaped through cold peening. A hot peened rivet will adjust to the countersinking perfctly and will have a fine graned perlitic structure when fisnished. This is a very tough and good rivet. In earlier periods the tang was probably of a steely iron, that could be shaped more dramatically while cold without adverse effects. To mimic the shape of traditional mountings when working with modern materials we have to apply moderate heat in the shaping of the peened rivet. Or we can choose to use a completely different method, like treaded nuts, pins or perhaps even super strong glue? What matters is how the method is applied and the understanding of materials used and the design of the object being made. Forging can indeed be used in making a superior blade, but it all depends on the knowledge and skill of the smith. The quality of any blade is in part depending on steel and structure (resulting in part of temperature druing forging and certainly heat treat). Equally important is the shape of the blade. I cannot stress this last thing enough: it is often forgotten in these discussions. If any of these lack in one or several aspects the blade will not reach its full potential. Often "handforging" is used as a label and guarantee of superior quality. This is miseading as the result is so largely depending on the individual skill of the craftsman (also, you never can tell just how much handforging was involved: this can and will vary between different craftsmen). If the smith knows what he is doing, is able to controll temeprature and has insights in heat treat, then the steel will have a good structure and a proper heat treat. All this is wasted howerver if the smith does not have enough experience and knowledge about swords: what shape must a blade have to be a proper sword? This infulences heft, dynamic balance, cutting performance...just about every aspect of the finished sword. Because of the importance of proper shape and proper heat treat, production method is not the single most important aspect in arriving at high quality. Forging can be a very good method in producing high quality blades. It is also the *only* method if you want to work with folded, laminated or patternwelded steel. Here is where forging really shines as a production method, especially in single unique project. Otherwise stock removal, by hand or by milling are perfectly good methods to produce blades, especially when many blades of exactly the sme shape are to be made with high precision. Needless to say, in all these production methods, the knoledge of proper blade shapes are equally critical for the outcome. Also note that "stock removal" is also a step in the making of a forged blade. it is a natural part in the making of any blade, regardless of type and production method. The way I see it forging can be important in the shaping of the shoulders of the blade even in a mono steel blade. Here is where forging can be used to some effect in shaping the grain of the material so that it follows the shape of the blade. This is however rather academic as a well proportioned blade will never have a single area where all stress is carried. If the blade has good proportions the junction of tang and blade need not be a weak spot. Again, the actual shape and proportion of the blade will be of grater importance than the production method. If the tang is too narrow, or the blade lacks in stress distributing qualities, then it matters little if forging or stock removal was used in the manufacture. Sadly this aspect is very seldom adressed when makers describe their products, methods and materials. As a result customers are often mislead to think that one method or material is automatically superior to another. In my studies I have found many examples of the sanwich or composite method. So many that I now tend to think it could have been the most common method. A sandwich or composite grip core can be ever as "strong" as a solid grip core. In some types of grips (narrow and long and/or grips on thick and sturdy tangs) the composite method is usually the better. Both methods were in use, however. Both methods need a high degree of precision if the end result is to be satisfactory. Again, it is the application and execution, not the method itself that results in the end quality of the weapon. There can also be modern methods of construction that can give satisfactory results, but again, it all depends on how it is done. It is not the method itself, but how it is applied and adjusted to the task, that yields the quality in the finished peice. To Rob: All this is said just to bring perspective to the discussion. I absolutely do not intend this as a personal critisism to your work or your ideas. Being a swordsmith myself I respect you as a fellow craftsman. Sadly, I have never seen any of your work first hand, only through pics on the internet: what I´ve seen seems to be fine work indeed. I hope to visit your part of Scotland some time in the future, and look forward to meeting you then, if possible. Until then: Best regards and keep up the good work! Yeah Rob, that is *really* nice stuff. Basically Peter made my point about peening, so I won't elaborate. There are no absolutes (wait a minute, is that an absolute?!?). It's more about the guy behind the fire. Forging can *potentially* make a better product, but it can also *potentially* make an inferior one. There are lots and lots of variables that come into play, so it's easiest for me to not confuse the issue by saying that one method is superior, especially since you have to do *some* stock removal either way. IMHO, destructive testing is a necessity. There are lots of variables there as well. If one wanted to find out the difference between the forging methods *they* employ and stock removal, it would be fairly easy to make two blades from the same bar, one forged, one not, with identical edge geometry, heat treat them identically, and then put them through identical tests. Unfortunately, if we had two different makers produce blades to be tested alongside each other, there would be too many unknowns to do a good comparison. It would be more of a "which smith is better" test. I forge. I forge a lot. I forge because it is fun, and it is the only way one can achieve certain effects and construction methods. I also think, coming from both perspectives, that it takes more skill to forge a good blade than simply by stock removal. And Rob, that is *REALLY* nice stuff. That's just what I like about this sort of construction. I certainly appreciate the historically accurate methods used by Albion, for example, but as somebody who loves to tinker with all things mechanical, a hilt that can be disassembled is a strong selling point. As for the durability of such construction, their may indeed be greater stresses on the hilt, as Patrick suggested, than on a hot peened hilt, but is the difference really great enough to make a lot of practical difference? 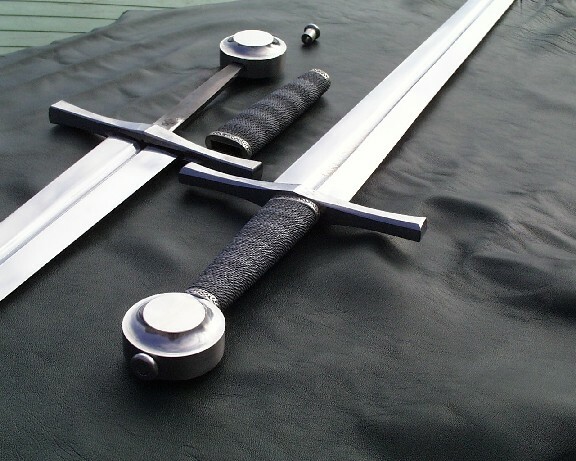 As Chad stated, Gus Trim's swords are, with the exception of a few custom examples, assembled in a very similar fashion, and I think it's safe to say that they have proven extremely durable.